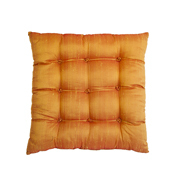 Cushion cover made with orange-colored silk. An elegant solution for your living room or your bedroom. accompanied by cotton napkins and napkin rings. Set of 3 coffers made of solid wood embellished by hand knitted iron. The coffer Streaks is ideal to embellished with a ethnic touch your living room or your bedroom. Curtain in schantung and georgette (plum) with particular upper edge, contrasting colors. To give a touch of color and elegance to your home. The hot plot of the Romeo mirror in wicker combined with the clean lines of its shape, will make precious any room of your home, such as the bedroom or the bathroom, or as the entrance and the living room. Wood frame, plot in wicker. Water-based acrylic finish absolutely non-toxic and hypoallergenic. With a small extra charge of price, the frame can be colored with one of the many colors of our samples which will be provided upon request.